Because self-sabotage can be fun. 2. Take a job you know you will hate, just for the money. 3. After no longer working at the job you hate, take another in the same field. This is called not learning from your mistakes. 4. Lie on your resume, and be discovered for it after starting your job. Omission of a three-month job (in which you were fired) from your resume isn’t a big deal. Omission of your status as a convicted felon is a huge deal. 5. 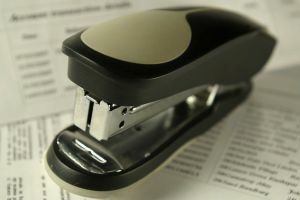 Throw a stapler at your boss. 7. Work more than 50 hours a week for any period of time longer than 6 months. Human beings are not designed to work this much. Wonder where road rage and heart attacks come from? Not just traffic and bad diets. They also come from overworked and stressed out people, believe it or not. 8. Flirt with your supervisor’s significant other. 9. Constantly bring your kids to work and let them run wild all over the office, spill things, damage office equipment and run into people. Good times! 10. Become a chronic yes-man. This is probably worst professional thing you can ever do. All you will ever aspire to is someone who can follow orders, do what others tell you, and sit around and look pretty. Ultimately, no one will respect you. It’s nothing but a one-way ticket to never advancing in a company, never escaping from the rat race, and maybe most importantly, chronic self-denial. It is, however, a great way to attain a low self-esteem and become depressed. 11. Steal from your employer. And no, erasers, stamps and post-it-notes don’t count! We are talking hard-core, five-alarm theft. If you don’t get caught, you got very lucky. If you do, (and you probably will) you are in for some serious problems. Way to go. How is prison? Was it worth it? 12. Look at illicit websites at work. Most workplaces monitor employer internet activity now. No, this isn’t fair, but it happens. 13. Play office games on the job. 14. Ardently pursue a field that is about to go extinct. They say we will not need many data entry processors or mailmen in the future. Be careful of what you get into and bring your crystal ball on the job search. 15. Hang yourself above the copy machine. If you are going to go out, go out in a blaze of glory. Imagine the look on your boss’ face when he sees you there, dangling above his prized copier. And to think, he had several documents to duplicate! The nerve! Oh well, time to start the interview process again.